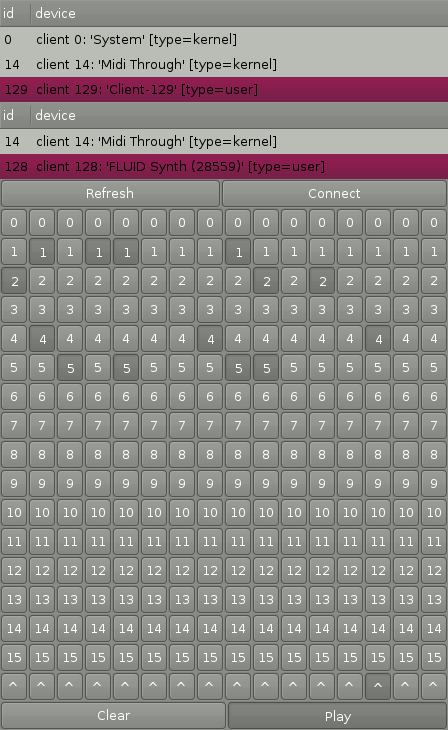 The other day I found out about tonematrix (inspired by Tenori-On from Yamaha) and started thinking what would it take to implement something like this. It looks very simple but I have no experience with any sound stuff. If you wish to try it out you'll need Linux (ALSA), Ruby, Gtk+ (with Ruby bindings) and MIDIator (just install Ruby gem). You will also need MIDI synthesizer – either hardware of software. I tested with TiMidity++ and FluidSynth (you will need some sound fonts files (SF2) for FluidSynth). After the program starts you'll need to connect the application to the correct output (usualy the last entries). You should be able to hear sound when you press connect.